Versatile British composer Tim Souster (1943-1994) had a feet in rock criticism; electroacoustic music (in Cambridge’s King College with Roger Smalley); television, film and library music; improvised music (with bands Intermodulation and Ødb); and contemporary music (as a radio producer with BBC3 in the 1960s and as Stockhausen’s teaching assistant in Cologne during the 1970s). In 1974, Pierre Boulez conducted his Song of an Average City for orchestra and tape in London. Souster’s first LP was SW1T DR1MZ in 1977, a unique mixture of avantgarde traits and cheesy synth sounds. See BBC portrait here. 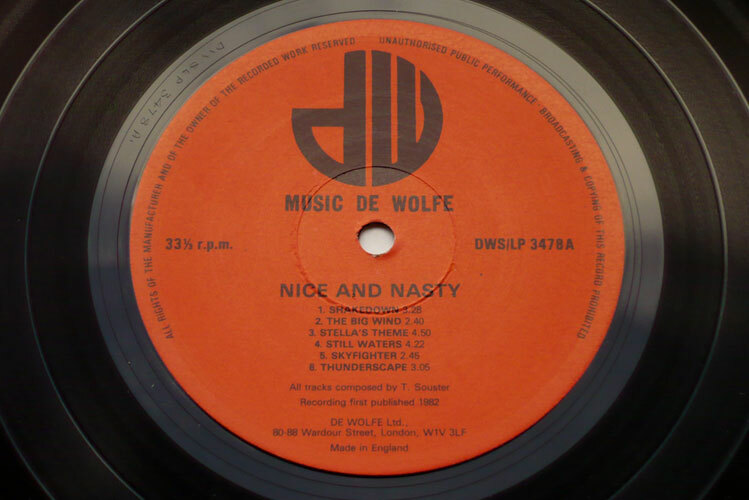 ♫ Published 1982, Nice and Nasty started Tim Souster’s collaboration with the de Wolfe library music company. If the cover art is any indication, the music is not intended for romantic interludes and, indeed, the 13 instrumentals on this LP would suit more thrilling, action-packed movies. The music goes from guitar/bass/drums pop-rock efforts to deep, melancholic ambient compositions, like the exquisite #3 Stella’s Theme, reminiscent of Colin Towns’ extraordinary Full Circle film soundtrack, 1979. But the LP also includes a personal take on dub (#10), as well as strange, semi-improvised experiments, or almost contemporary music on percussion in the 2 last tracks. These latest posts look so good. Thank you! Oh, sweet – I don’t have this. Thank you ! The discography is quite helpful too ! Thank you, guys. It’s my pleasure to delight the ears and help the researcher. I don’t know enough Souster so this is a welcome addition to my ‘collection’ (i.e. SW1T DR1MZ). HI, John. I’d also like to hear more from this interesting composer. I’ve just seen that the London Sinfonietta are performing Spectral (which I think is on SW1T DR1MZ [available here: http://mutant-sounds.blogspot.com/2007/04/tim-souster-swit-drimz-lp-uk-1977.html%5D) at King’s Place in London on Friday 21st October (http://www.londonsinfonietta.org.uk/node/793). Check this link out for an interview with Souster from 1978, conducted by Charles Amirkhanian: http://www.archive.org/details/MC_1978_11_10. The programme features a performance of Driftwood Cortege, and excerpts from Spectral and Surfeit. His widow, Penny runs 0dB Editions, which published most of his instrumental work, and she used to maintain a web presence for his music as well, but that seems to have gone now. I had come across some of these links while researching this post, but wasn’t aware of 0db Editions, though. Thanks for your knowledgeable comment, John. Missed it both times. Any chance of a re-up? Thanks!